Putting people in the Christmas spirit, members of Cowley College’s Concert Choir and CC singers gave an inspired performance during the Christmas Vespers concert held Sunday in the Robert Brown Theatre. The Concert Choir and CC Singers took the stage under the direction of David Smith to perform songs people treasure this time of year. The CC Singers and Concert Choir performed such favorites as Deck the Halls, Let It Snow! I’ll Be Home for Christmas, and Silent Night, as well as some lesser-known Christmas music. “It was a lot of work in a short amount of time, but I was pleased with how it all turned out,” Smith said. The Memorial Bell Choir from First United Methodist Church in Winfield, KS also performed under the direction of Cowley alumnus Chance Alquest. 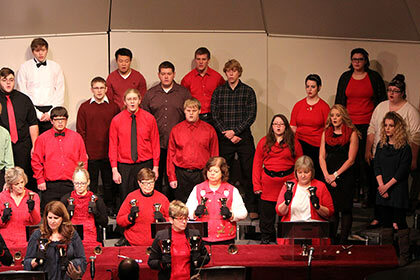 The Memorial Bell Choir performed three pieces on their own and accompanied the Concert Choir in their last selection. “They did a marvelous job,” Smith said. Following Vespers, audience members were invited to the college’s Earle N. Wright Community Room for a reception hosted by the Cowley College Foundation.